St. Joseph’s (17-3, 6-1 A 10) will go on the road to face Rhode Island (12-8, 4-3 A 10) in hopes of staying red-hot in conference play on Saturday. The Hawks are winners of their last 6 and have only dropped one game in Atlantic 10 play this season- a home game to VCU. The Rhode Island Rams enter this contest having lost three of their last five. They’re in desperate need of a win moving forward in conference play. 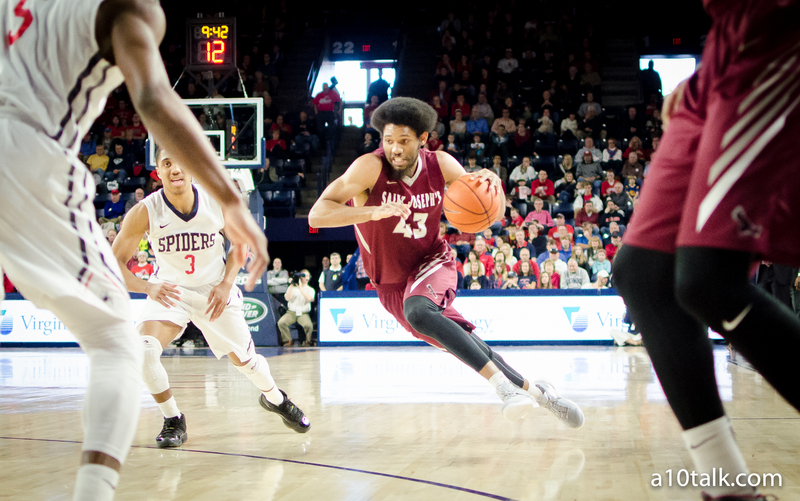 This one should be a classic battle between dominating forwards: St. Joseph’s DeAndre’ Bembry and Rhode Island’s Hassan Martin. Both have been excellent for their respective teams this season. That being said, the real threat for St. Joseph’s could be Jared Terrell; he had a game-high 25 points on 7-10 shooting in the Rams’ most recent win over Fordham. Get him going, and Rhode Island could be tough to stop. But don’t count out the Hawks; they have a dominating player in Isaiah Miles who is also coming off a dominating performance. He had 27 points and 12 rebounds in St. Joseph’s most recent win over Massachusetts. This should be a great matchup between two high-level teams. The question is: whose stars will shine brighter? These two teams enter the conference trending in the wrong direction. Fordham has lost 5 of its last 6 games; Massachusetts has lost 6 in a row. The importance of this game for turning around these teams’ seasons can’t be understated. Both need something to grasp onto in order to try to grab some sort of momentum. Massachusetts’ Trey Davis has been great, averaging 19.5 points per game, but he can’t be the one doing it all. The Minutemen will need someone else to step up in order to contain Mandell Thomas and Ryan Rhoomes on Saturday morning. La Salle was able to take down Dayton towards the beginning of conference play to shock the entire A-10. That would be La Salle’s first win and Dayton’s first conference loss; neither of those things have changed since. The Explorers’ upset win over the Flyers proved to be a bright spot in their very troublesome season. In fact, that win serves as their only victory since November of 2015. Yikes. Dayton enters this one as a 20+ point favorite and shouldn’t have any problem taking down La Salle. That being said, the Explorers know that they have what it takes to beat the Flyers, so you can’t count them out just yet. Both Duquesne and Saint Louis enter this matchup with some recent success. The Billikens found a away to take down Davidson and Massachusetts in the past week and a half, but they got absolutely destroyed by Dayton last Wednesday, losing 37-73. The Dukes have won two straight, taking down George Mason and La Salle, but they still have yet to make much of a move in the Atlantic 10. This contest will provide two different momentum swings, depending on the outcome. Whichever team emerges victorious will have won three of their last four games. Considering both teams have tough stretches in their upcoming schedules, a victory here is pivotal for both sides.